I was sad to read of the death of science fiction writer Ray Bradbury earlier in the week. I won’t repeat here a mini biography of Bradbury, suffice to say that he was an early innovator, long-term and stalwart advocate and then elder statesman of the genre. His fiction is well-respected, frequently anthologised and nominated for numerous awards. His passing is a clear loss for science fiction writers (to whom he was an inspiration), science fiction readers (to whom he provided so much entertainment) and culture generally (to which he contributed a great deal). His works are too many and too wide-ranging in subject matter to summarise but my personal favourite is the short story A Sound of Thunder, which I not only love personally but had the privilege of teaching it to a class of thirteen year olds. 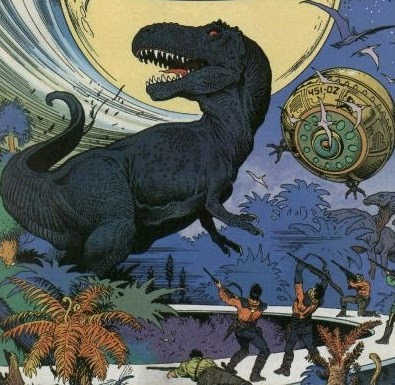 I’m not sure that they appreciated his skill and imagination as much as I did, but they certainly loved the idea of the characters hunting a Tyrannosaurus Rex on a Time Travel Safari!